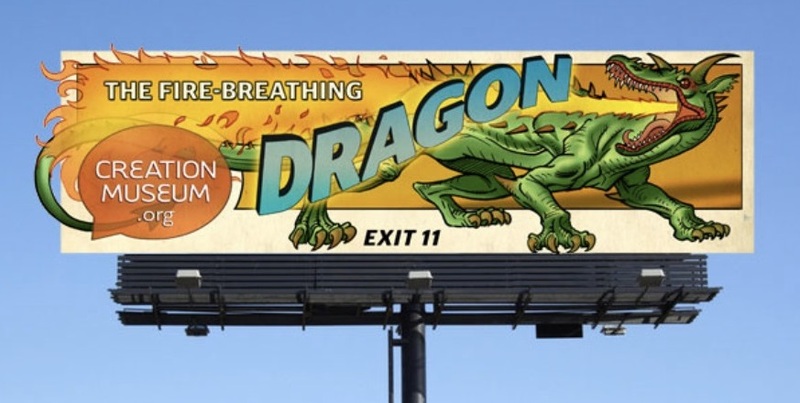 A billboard advertising the new dragon exhibit at the Creation Museum. 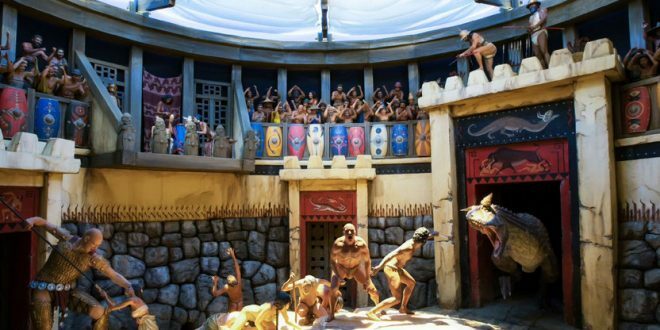 A pre-Flood arena depicting the depravity of human beings before the Flood. Notice the dinosaur entering on the right side. Ken Ham skirts the question of whether all dragons diversity should be equated with dinosaurs or if some dragons could have been something wholly different. What about dragons with no legs, wings and legs or the many that are said to breath fire? Note the billboards they posted include an animal breathing fire and a snake-like dragon with no legs. Around the same time I criticized Dr. Purdom at Answers in Genesis for her dismissal of Adrienne Mayor’s thesis about how encounters with preserved bones in the Middle East region were likely the physical sources of the drawings and stories of what we often consider mythical creatures such as dragons (Dinosaurs, Dragons and Ken Ham: The Literal Reality of Mythological Creatures). I responded to several comments to that article but one in particular I wish to explore further. The question I received was about how I might respond to eye-witness accounts of dragons throughout history and Marco Polo in particular. Below I repeat and expand on my response to this inquiry. Regarding eye-witness reports of dragons: I have no doubt that many of those reports were written as sincere fact-based reports. However, that does not necessitate that the reports were describing actual dragons as Ken Ham believes. The human eye and brain are both sieves of reality for us. If we have heard stories that we believe are true and then see something that fits some parts of that story our minds will fill in the gaps. For example, a crocodile is a fearsome creature and few in ancient times would get close enough to really study a living one in detail so most everything known would be hearsay bits of evidence that got compiled overtime into a general concept of what a crocodile or a komodo dragon or any of several real animals. Someone like Marco Polo, who records having seen a dragon, may have seen something he thought was a dragon. But if he had heard any stories (very likely) about such creatures then his mind would fill in the gaps of his likely short encounter with a crocodile, or several other creatures in southeast Asia, with images that were mixture of what he actually saw with what he expected to see. Writing down his encounter we have no need to believe he embellished the account. Rather he simply recorded the facts as he remembered them because his memories were facts to him. However those facts may not match with the reality of the event. We know this is the case because he recorded many other observations in addition to dragons which no one believes are true (even creationists). It really isn’t hard for any of us to believe “facts” about things we don’t understand well. This phenomena of memory is well-studied and documented. 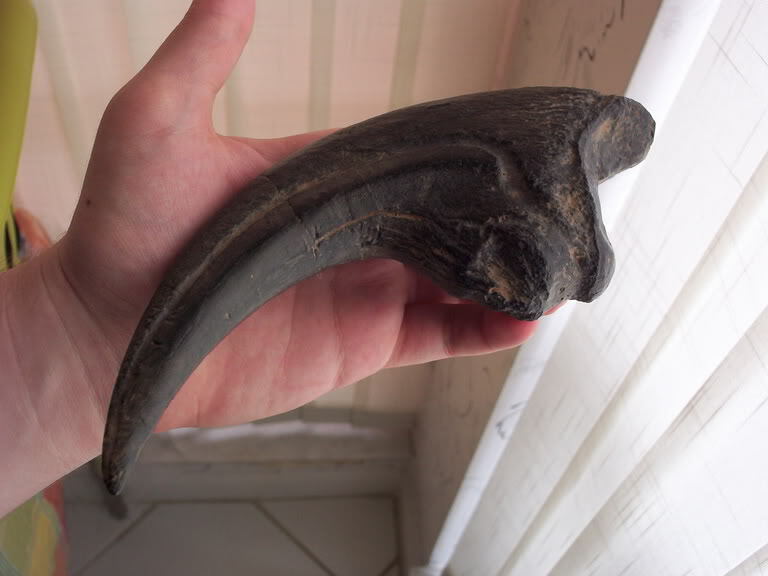 Imagine finding a claw like this and not knowing what a fossil is. What would you do? Naturally, you would naturally associate it with a living animal that you didn’t know much about or you would imagine that there a creature you have yet to see that has claws this size. Let me illustrate with some examples of how real events can become intertwined with fiction. What about fire-breathing dragons which the Creation Museum claim existed not long ago? Swamps have swamp gas which is known to flare naturally occasionally. All it would take is for one flare to happen at the same time that a crocodile is emerging from a swamp in an attack for a person just barely escaping with their lives to truly believe that the crocodile breathed fire. Once one credible person has witnessed this and told 20 friends, every time those friends see or hear of a swamp flare they will associate it with a crocodile even if they didn’t actually see the flare coming from a crocodiles nostrils themselves. They will go on and tell 20 more friends and so on. No one made this story up. It isn’t a fairy tale. Every person who told the story believed it was true and many even believe they have witnessed an actual dragon. But all of this doesn’t make fire-breathing dragons real. Like the telephone game, even when each person believes they are passing on factual information they still don’t transmit the information word for word and thus the interpretation causes changes in the message over time even though each person along the chain believes the message to be true. 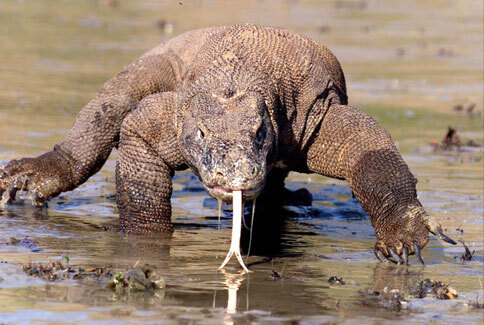 Komodo dragon from Indonesia. No doubt many images of dragons from this area are inspired by this large reptile which was more widespread in the past. Combined with some bones or large animals that lived prior to the last ice age one would expect that legends of great beasts should be prevalent. Most dragon legends and eye-witness accounts are hundred or even thousands of years old. Even by the time paintings of dragons were put on pottery or etched on stone walls the stories that inspired the artists could have been hundreds or thousands of years old. Interestingly, there are more eye-witness report or artistic evidence (paintings and drawings) of winged and fire-breathing dragons around the world than there is of dinosaurs. Maybe this is partly why Ken Ham believes these dragons are as real as dinosaurs. Since dinosaurs are obviously real and in his mind and lived among humans then the fact there seems to be as much evidence for dragons having lived recently must mean they are real. But the fact that dinosaurs existed in the past is not reliant on eye-witness reports but is found in vast number of bones, footprints, eggs and feces they left behind for us to inspect and infer their existence and characteristics. Where are the dragon skulls? Where are the dragon bones showing four legs and a set of wings attached to the same body (Pterosaurs had legs and winged arms, not arms and wings!)? The physical evidence for dragons is missing unless you include skeletons of komodo dragons which look dragon-like but would not foot the bill for the type of dragons that Ken Ham envisions on earth. Obviously aliens visited us 3000 years ago since their visit is recorded for us here. 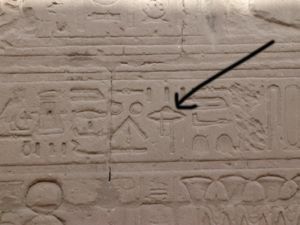 There are many similar images that are interpreted as spacecraft or aliens found all over the world. If UFOs and aliens are not real why should the same evidence for dragons be taken so seriously? Dragons are only known from human art and stories. That got me wondering if there were other examples of things that people believe in that also lack physical evidence. How about UFOs? Are they real? I personally don’t believe we have been visited by UFOs/aliens. However, there are hundreds if not thousands of people who have reported to have been eye-witnesses of alien visitors and their spacecraft. In fact, I am sure there are far more detailed accounts of UFO sightings than there are of dragon sightings. Yet, I don’t believe that extraterrestrial life forms have been visiting us all these years. Does this mean I think that all those stories are totally made up? Are these “witnesses” making the story for monetary gain or to draw attention for themselves? There is no doubt that sometimes this is the case. But I also believe that many people who tell of UFO encounters are absolutely sincere and believe everything they have reported is factual. Frequently what you will find with most UFO stories is the person that saw something has typically been exposed to other stories about UFOs. In response, they have taken something they have really seen but that they didn’t fully understand and their brains have interpreted what they have seen to fit those stories. When they remember the scene later, their brain fills in facts for them without them even being conscious of it and so they report things as facts that are not really facts. This is a common problem for police as they collect eye-witness accounts of accidents or crimes. I experienced this myself when I was a teenager. I witnessed an armed bank robbery. I stood no more than four feet from the perpetrator as he pulled out his gun and pointed it at the teller. I looked at him nearly straight in the face. Yet, a few hours later when I worked with a police sketch artist I provided very inaccurate information about his clothes, attributes of his gun and facial characteristics. I didn’t do this intentionally but rather the drama of the moment caused my mind to quickly derive what I thought a bank robber should look like and obscured his real appearance from my mind. I was told that my eye-witness report was in complete odds with several others that were also in the bank. I still have an image etched into my mind of that event that really happened to me but I have no doubt that image is highly inaccurate. The point is that the stories of dragons and images drawn of dragon-like things are far from slam dunk evidence of their existence. Some sort of physical evidence in addition to eye-witness reports is really needed to bolster the case for their reality in the same way that physical evidence of an extraterrestrial craft is needed to corroborate eyewitness reports of flying saucers. I wish I could say that I don’t understand how Ken Ham and friends would hype this new exhibit but I feel quite confident the reason is that they expect dragons to be real because of the worldview they have constructed for themselves causes them to cognitively interpret every scrap of evidence for dragons as “proof” of their existence knowing they must exist. It is the mind filling in the evidence and “seeing” what is not there. Of course Ken Ham would say that he derives his initial belief that dragons exist from the only true eye-witness account which cannot be false in any way. That eye-witness would be the authority of scripture. I won’t quibble with the word of God but I can confidently say Ken Ham is not an infallible interpreter of Scripture. The weakness of the physical case of the existence of dragons should at least be a clue, even if it isn’t proof, to Ham and others that he needs to ask himself if he has interpreted the Scriptures inappropriately. * There are some apparent age advocates and other lay creationists that will argue that dinosaurs never really existed but rather their bones were created as part of the creation. I’ve been told by many people that they grew up with parents who told them that dinosaurs didn’t really exist. That denial doesn’t seem to be based on any particular evidence but rather seems to be a reaction of those who seek to alleviate the perceived tension of the evidence of an ancient earth and a literal reading of Genesis. A billboard advertising another new attraction at the Creation Museum. AIG spent more than two million dollars on advertising including a large billboard campaign. This article is an updated version of one originally written in 2013. I’ve had individuals tell me this directly and I have had at least 10 people they have family that believe that dinosaurs bones are tricks of the devil to test our faith. I seem to remember there was a rather well-known pastor that was making such a claim and might be the origin of this belief but I need to go back and research that again. Claims that God (or the devil) put fossils directly into rocks go back at least several hundred years. I remember hearing stories in the 1950’s and 1960’s which took yet another stance on this. It was basically “God planted dinosaur bones in the ground to test the faith of his people and to frustrate the godless atheist scientists.” I never quite understood why anybody thought that this would frustrate scientists. Of course, I also wondered why anybody thought a God of holiness and truth would seek to deceive by placing pseudo-fossils in the ground of animals which never existed. Even earlier (1857), Philip Gosse published Omphalos: An Attempt to Untie the Geological Knot. This was two years before Darwin’s On the Origin of Species (but after Gosse learned of Darwin’s ideas through scientific meetings and such). Gosse argued that fossils were not evidence of evolution, but that God created the Earth, including rocks, with the “appearance of age.” Many have since ridiculed him for suggesting that Adam would therefore have been created with a navel, or otherwise that the Creation would contain features suggesting a false history, and therefore imply a deceptive God. However, many YECs still use the “appearance of age” argument in regard to distant starlight and other aspects of their model. I’d say it’s rare to hear the “Satan’s Tricks” claim, but it’s definitely not a one-off. By the way, I hope to be heading down to Texas to do more track work in a couple weeks (if rains this weekend don’t flood the riverbed). If anyone wants to join in (we can always use more hands), please contact me at gkpaleo@yahoo.com. Thanks! I meant to leave the following link. Seems quite ironic, since I just got back from a trip collecting dinosaur bones in SD, where I found dozens of bones from several different species. There are also many public sites where one can see dinosaur bones or tracks in their natural state. Evidently the authors (if they are serious) never bothered to visit any, or perhaps believe they are all part of the conspiracy. :). Like the mythology surrounding dragons, the big creationist organizations are becoming more adept at incorporating what they see as competing narratives, even paranormal ones, into their existing Christian paradigm. Take UFology. CMI has a writer, Gary Bates, who writes extensively on the subject of UFO’s and purported alien abductions. His way of addressing the phenomenon, and vitiating its cult-like appeal, is to posit firsthand testimonies as manifesting demonic possessions, and similar such forces or entities. Bates attributes these to ‘fallen angels’, and of course, Satan. And Bates is not above dragging evolution into the mix, railing away at its supposed harmful influence on the wider culture. That too is explained away as Satanic in origin and intent. In short, yes, ‘abductees’ may be experiencing something powerful they find difficult to explain, but Bates believes there are standard ‘spiritual’ explanations to account for this, not ruling out that often simple naturalistic explanations, such as hallucinations or some form of mental illness, can suffice in the majority of cases, anyway. This is not too dissimilar to the Catholic Church’s position on exorcisms in alleged demonic possessions, by the way. Christianity has a long, proven track record of successfully incorporating preexisting or rival beliefs into its practice and lore. Possibly only evolution is resistant, at least to YEC, though it’s funny to see AiG conceding natural selection and adaptations, only to deny their role in the bigger picture that evolution contends. I don’t know what AiG’s take on UFology is, though Ken Ham, of course, often scoffs at or downplays the possibility of life elsewhere in our universe. 2. ICR implies that “evolutionists” have no plausible answer to Gentry’s halo claims, even though they have been well refuted by several authors, including even fellow YECs such as Kurt Wise. b. Appealed to ad-hoc miracles to explain the ad-hoc acceleration. c. Appealed to more ad-hoc miracles to protect the Earth from the massive heat and radiation such acceleration would have caused (which would have killed every living thing on Earth). d. Never explained why God would accelerate decay rates in the first place, since its main effects would be to fry the Earth and make it look old. Just this weekend in Cedar Rapids, while celebrating 50 years since my marriage in Milwaukee three weeks after the 1968 riots, I got to tell a science-minded niece and her cousin about the importance of the rock bits full of fusulinids that I sent home with them. These were river-run rock from the Kansas River at Topeka — Permian country — and if they were all “deposited” in such mass quantities by God’s single, chaotic, worldwide Flood, as Ken Ham & Co. claim, then HOW or WHY did the Flood n-o-t deposit a-n-y of these grain size single cell marine creatures anywhere – starting a few days later – in any Mesozoic strata? You may as well boil up a pot of chicken & rice soup to fill 20 bowls, and then find no rice at all in any of the first or last bowls filled. That’s what I told them.